So You Think You Can Mom? 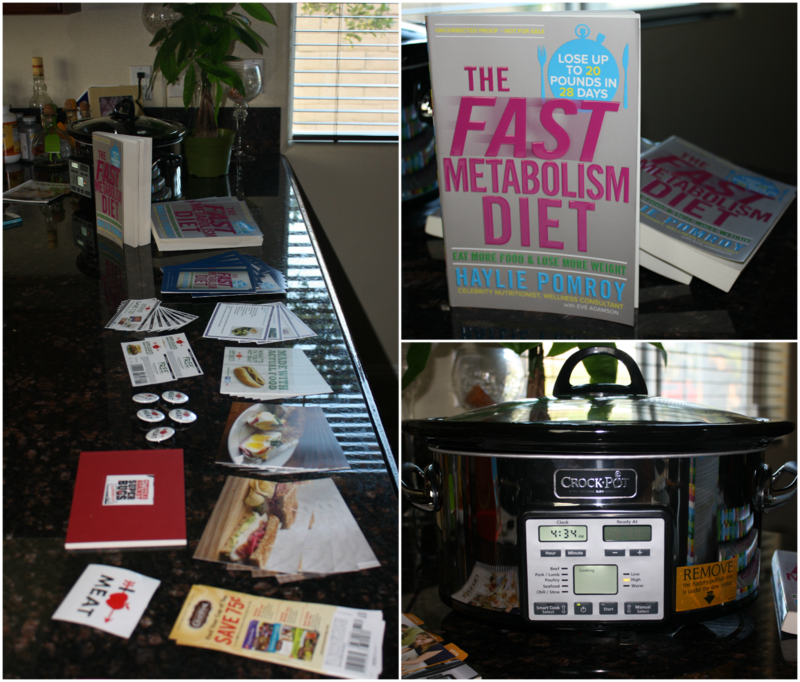 : The Fast Metabolism Diet Party! The Fast Metabolism Diet Party! It's no surprise that diets are not easy. This is old news, right? Often times our hectic schedules are to blame for poor eating habits. I am so consumed with my daily routine that I just can't even think about dieting...until now! Thanks to The Fast Metabolism Diet by celebrity nutritionist, Haylie Pomroy, I can lose up to 20 pounds in 28 days by following the 3 phases of her simple plan. Haylie's book is not your typical "diet" book. It's more of a handy helper that teaches you how to trick your metabolism by rotating what you eat each week and by NOT counting calories! She believes that by eating more food we can lose more weight and I like the way that sounds! If you can stick to The Fast Metabolism Diet, in 4 weeks you should be able to see the weight loss, your cholesterol drop, your energy increase, your sleep improve and your stress levels decrease. Now, why wouldn't you want to give it shot? 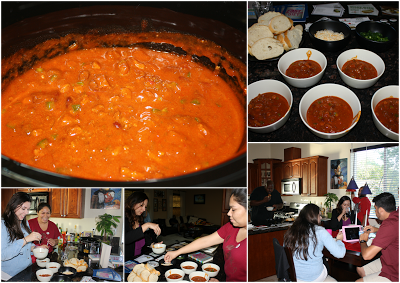 I couldn't wait to share this book with my friends and family so I hosted a "Diet" Party and invited them over to check out the book and try a new chili recipe made in my fancy new slow cooker. The girls didn't hesitate to crack their books open and start reading about Haylie's plan. They were surprised to see so many healthy versions of their favorite foods. Haylie's book offers 4 weeks of meal plans with over 50 recipes included. She also has vegetarian, organic and gluten-free options. I even got the guys in on all the healthy action! Who says men don't diet? I decided to serve my friends chili for the party because I think chili is the perfect comfort food to gather friends around a table and dig into a good book. Haylie has an amazing chili recipe in her book that is so easy to follow. All of the ingredients go right into the slow cooker for 5 hours. That gave me plenty of time to set the table, prepare all of the garnishes and read a little more of the book myself. The chili was a HIT!!! Even my husband said it was the best chili he's had. Thanks Haylie! We had a great time learning how to boost our metabolisms while eating a great meal. This is definitely a plan that I can make time for. I look forward to seeing the progress we all make in 4 weeks. Make sure to get your copy of The Fast Metabolism Diet and see if you can lose more weight by eating more food! Brown the turkey or buffalo meat in a skillet and drain. Turn a slow cooker to high setting. Add the meat, onion, parsley, chili powder, garlic, and red pepper flakes to the pot. Stir, cover and set aside. Open and partially drain all 5 cans of beans; I leave a little liquid in to make my chili a little juicier. Add the beans, zucchini, and soup to the cooker. Stir well. Keep the cooker set on high for 4 to 5 hours or adjust heat to low and simmer for 6 to 8 hours. Stir and taste occasionally, adjusting seasonings as needed. Add the salt just before serving to best preserve its nutrients. Note for those following the Fast Metabolism Diet: This meal is appropriate for Phase One. Because this chili contains such a large amount of starchy legumes, it counts as a Grain as well as Protein and Veggie servings. No need to add an additional grain to the meal, even if the meal map specifies a grain. Disclosure: I was not compensated for this post. I was offered sample books and asked to host a party. These are just my two cents! This explains the increased number of weight loss products in the market today. learn how to buy i am not sure how it can helps.. Any suggestions?? ?